Esophageal adenocarcinoma arising from heterotopic gastric mucosa (HGM) is extremely rare  . 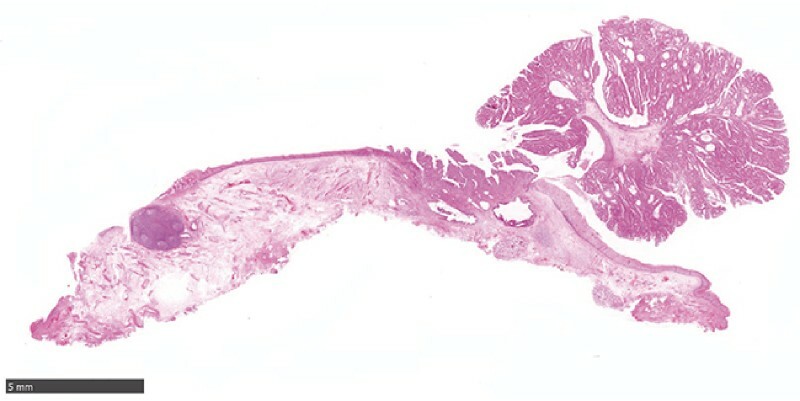 We describe a case of esophageal adenocarcinoma arising from HGM in the cervical esophagus that was treated with endoscopic submucosal dissection (ESD). A 58-year-old man found to have an esophageal tumor on endoscopy was referred to our hospital for further examination and treatment. Conventional endoscopy revealed circumferential HGM of the cervical esophagus and a 20-mm protruding lesion in the posterior wall. Poorly defined reddish mucosa surrounded the protruding lesion ([Fig. 1 a]). Spraying with indigo carmine visualized the flat lesion in the reddish mucosa, but the demarcation line was unclear ([Fig. 1 b]). Narrow-band imaging (NBI) revealed a clearly demarcated brownish area consistent with the reddish area at 18 – 21 cm from the upper incisors, with villous and glandular structures of various sizes and dense distribution of abnormal capillaries ([Fig. 1 c, d]). Biopsy showed adenocarcinoma, with no evidence of deep submucosal invasion. Therefore, ESD was performed using a dual knife (KD-655L; Olympus, Tokyo, Japan) and an ITknife nano (KD-612; Olympus, Tokyo, Japan) ([Video 1]). The resected specimen measured 51 × 35 mm and contained a macroscopically measured 32 × 27-mm tumor surrounded by HGM. Histologically, the tumor cells showed well-differentiated adenocarcinoma in the muscularis mucosa ([Fig. 2]). Immunohistochemically, the tumor cells were positive for mucin (MUC) 2, MUC5AC, and MUC6. Fig. 1 Cervical esophageal adenocarcinoma arising from heterotopic gastric mucosa (HGM). a Conventional endoscopy revealed circumferential HGM of the cervical esophagus and a 20-mm protruding lesion in the posterior wall. b Indigo carmine spraying revealed a flat lesion in the reddish mucosa, but the demarcation line was unclear. c Narrow band imaging (NBI) revealed a clearly demarcated brownish area consistent with the reddish area (arrowheads). d Magnifying NBI revealed villous and glandular structures of various sizes and a dense distribution of abnormal capillaries. Video 1 Endoscopic submucosal dissection of cervical esophageal adenocarcinoma arising from heterotopic gastric mucosa. Fig. 2 Histologically, tumor cells showed well-differentiated adenocarcinoma in the muscularis mucosa. The estimated incidence of HGM of the esophagus is 0.75 % – 11 % based on endoscopic studies  . Primary adenocarcinoma arising from HMG is rare and several cases of mucosal cancer have been reported   . The macroscopic appearance was protruding or polypoid in most cases ; therefore, adenocarcinoma should be suspected when a protrusion is identified in HGM in the esophagus.